Allied Forces invaded the beaches of Normandy, France, on June 6, 1944. 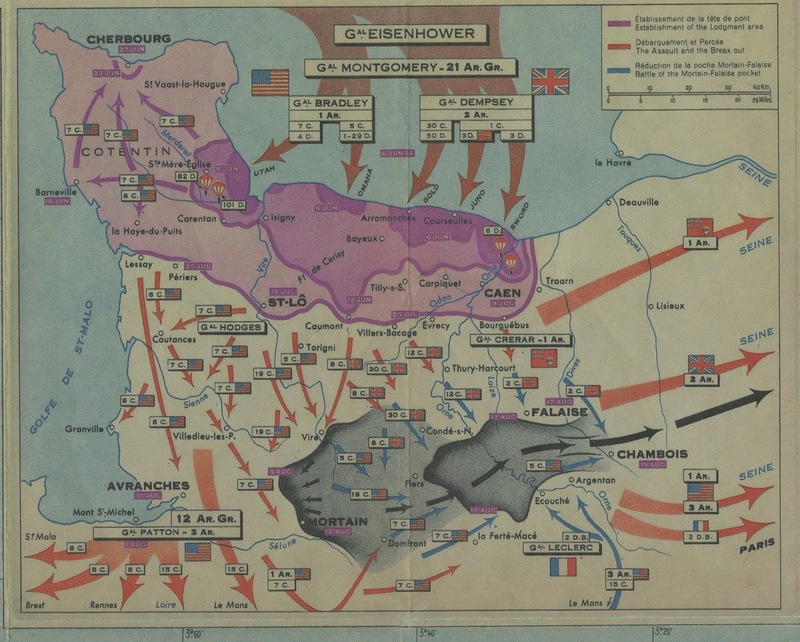 The Ball State University Libraries GIS Research and Map Collection (GRMC) includes several original maps and historical reproductions that depict the D-Day invasion. The top map is an inset map from a Michelin map published in 1947 available from the GRMC that details the military actions of that day. The map is printed in English and French. The GRMC also includes several maps produced by the Office of Strategic Services (intelligence agency) and the Army Map Service in preparation for the invasion. 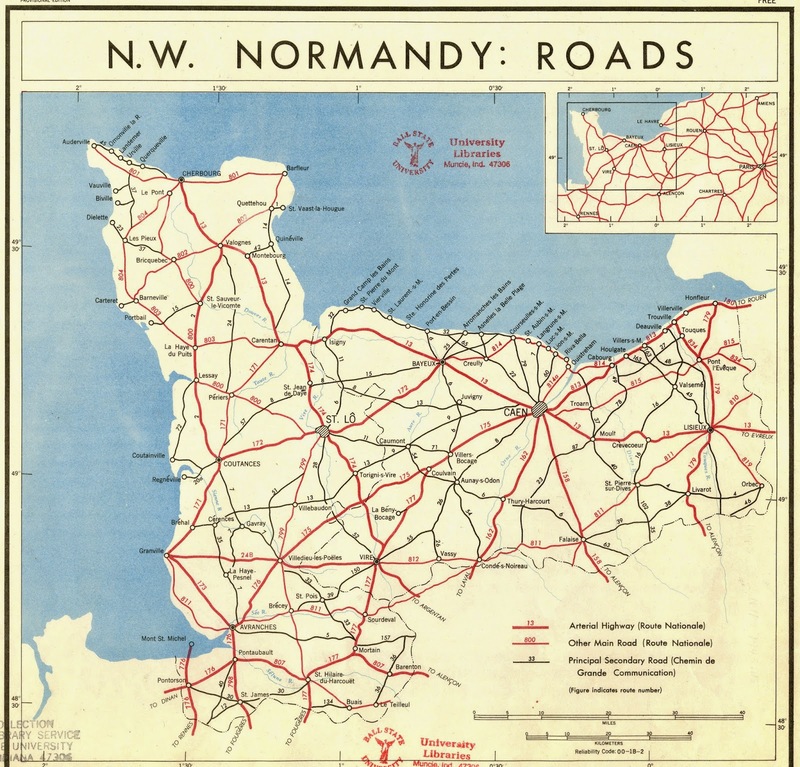 This set of maps shows the locations of roads, railroads, ports, and other important sites. 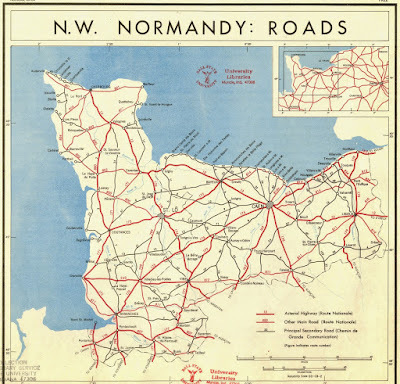 The map of Northwest Normandy (above, click to enlarge) identifies the roads in the area of the invasion. 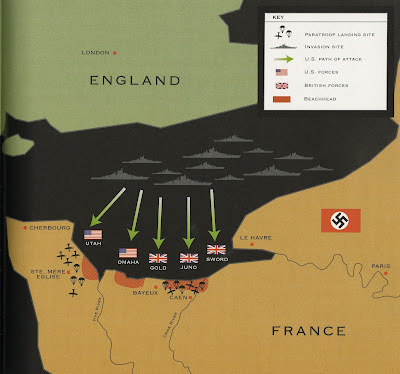 Even the creation of these maps was top secret as to not give the enemy any clues to where the invasion by Allied Forces of mainland Europe would occur. The Army Information Branch in New York also published newspaper-type maps during World War II, and the GRMC includes several of these “Newsmaps.” The photographs above from these maps show American and Canadian troops landing on the beaches of Normandy—Canadians with bicycles. 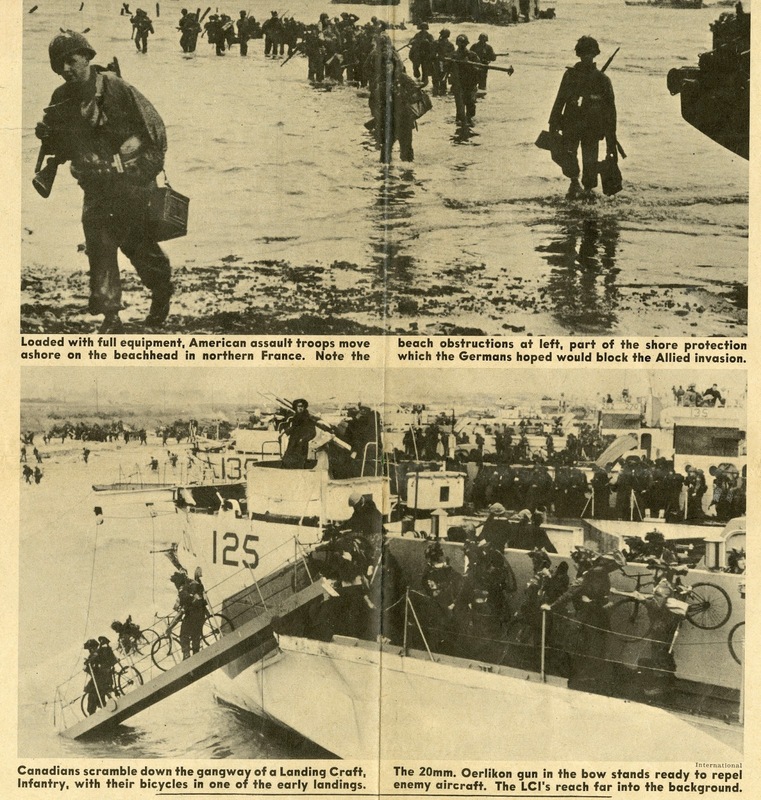 These photographs were included in the “Newsmap” published for the week of June 8, 1944. 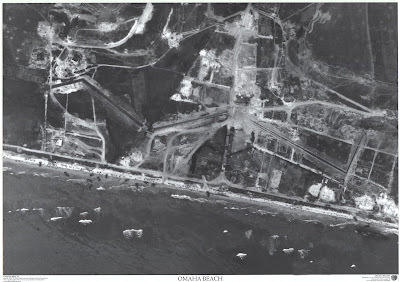 The GRMC also includes a reproduction map of a reconnaissance aerial photograph of troops landing on Omaha Beach on D-Day. Landing craft can be seen along the beach, and reinforced German lines are shown at the top of the map. 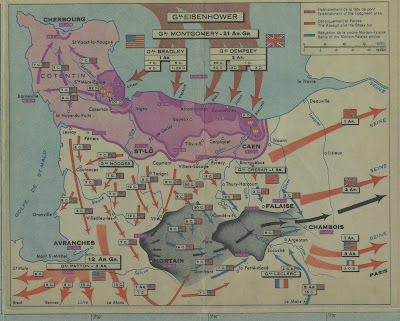 The D-Day Atlas: Anatomy of the Normandy Campaign is also available from the Atlas Collection on the second floor of Bracken Library. 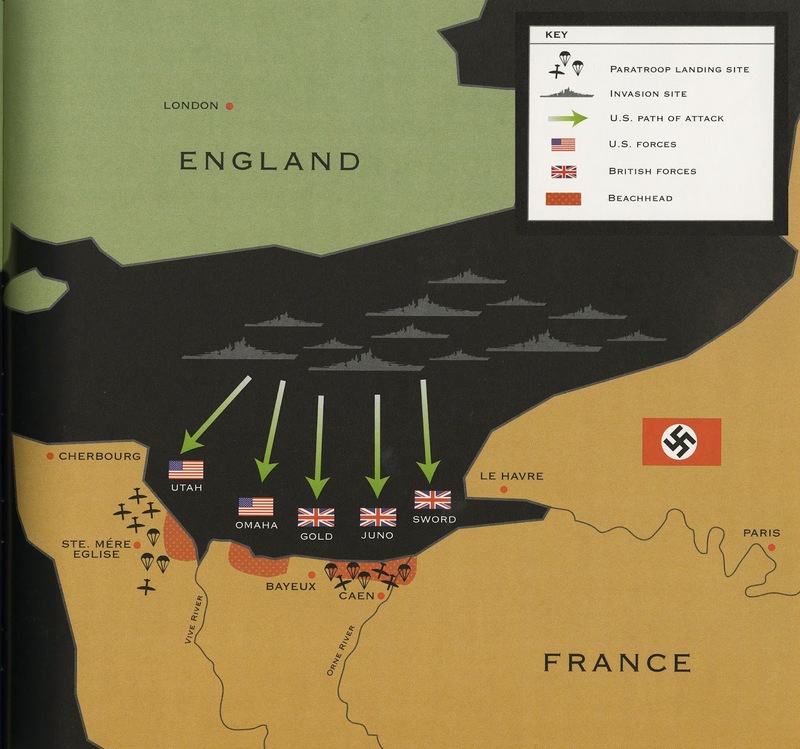 The atlas was written by Charles Messenger in 2004 and includes maps and images from the D-Day invasion. The Atlas Collection also includes Atlas of Special Operations of World War II, Military Atlas of World War II, U.S. Army Atlas of the European Theater in World War II, and Penguin Historical Atlas of the Third Reich. The bottom image is a map featured in The Good Fight: How World War II Was Won by Stephen Ambrose. This book is available from Educational Technology and Resources in the lower level of Bracken Library. These historical maps and resources may be borrowed for classroom research or exhibits. All maps from the GRMC circulate for two weeks or longer. For more information, please visit or contact the GRMC at 765-285-1097 from 7:30 to 4:30 pm on the second floor of Bracken Library.